The happiest horses we know, are right here. Even inside it's sunny. 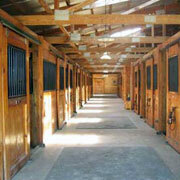 Our skylit stable aisle is just one example of how at Spring Willow Farm, we treat the horses as our guests. We offer our equine guests the kind of care we used to search for while taking our horse from barn…to barn…to barn. All-day turnout is a given, and the couple that manages our barn lives here and cares for the horses 24/7. That means you’re welcome to ride at any time that suits your schedule – in the indoor or outdoor ring, or on trails through 100 acres of woods, prairie, ponds, wetlands and fields. Please browse our website for a glimpse of life here at Spring Willow or better yet, call or e-mail us to arrange a visit. We’re 10 minutes north of the Illinois state line, and 40 minutes south of Milwaukee – only 5 miles west of I-94.